Needless to say, we are not alone in fostering dogs — not in our community, and not in the blogosphere. While we are away traveling and making our transition to our new home in Austin, we thought it would be fun to bring you some other fostering perspectives and reflections — from foster families we admire and respect. For our first post, we are excited to bring you this interview with our friend Jenn, mama to the world-famous pit bull, Corbin. We think Corbin is just about the most handsome guy around — he easily gives Sir Chick a run for his money, anyway. Jenn and Corbin foster dogs in the Albany area of New York, and they do it with great success, grace, and humor. Read on. 1. Why did you begin fostering dogs? decided to foster. This would give us the experience of having a dog in the house, I could see how Adam reacted and whether or not this relationship would work with a dog –and, I’m pretty sure Adam knew if the dog didn’t fit, neither did I! I saw a cute, cuddly Border Collie mix puppy on a rescue website and decided to put in an application. A day or two later, I received a phone call and explained that I thought that puppy was cute, but really wasn’t home enough for a puppy. I also told her that I’d be interested in fostering. She told me to stop by clinic the following Saturday, and that they’d have more dogs coming in mid January for fostering. And, as the story goes… I went in to talk to someone, swearing to Adam I wouldn’t be coming home with a dog. Half hour after I left the house, I’m calling Adam to tell him that Corbin, our new foster dog, was heading home to meet him. 2. Tell us about your first fostering experience. Corbin was our first foster dog. My mom even bet me $25 that I wouldn’t be able to give him up, but I was determined to just foster. I didn’t want to adopt my first foster dog because I knew there were so many out there, and I wanted to “test drive” a few dogs before we decided on adopting. 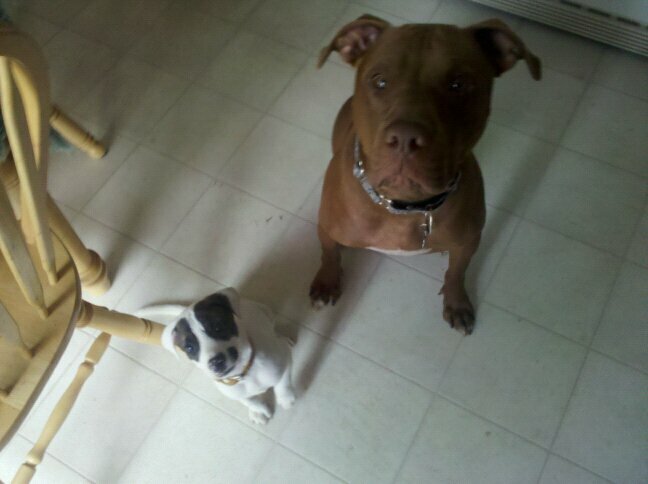 I knew nothing about pit bulls at this point in my life. I wasn’t scared of them but a little hesitant because I was uneducated. Corbin taught me a lot about their love, their affection, their strength and their smarts. He was a wild and crazy, completely out of control, spastic 6 month old pup when he came to our house. 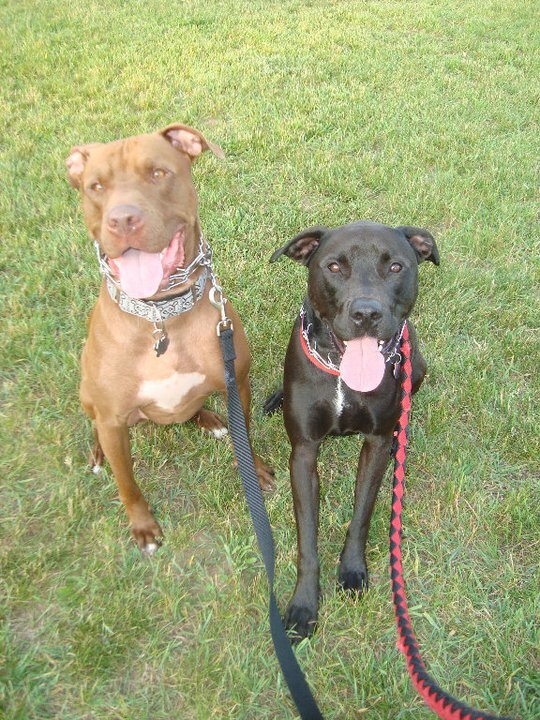 We worked hours on basic obedience, sit, down, high five, stay, wait, etc. He loved anyone and everyone and always attracted a lot of attention at clinics because of his handsome looks. 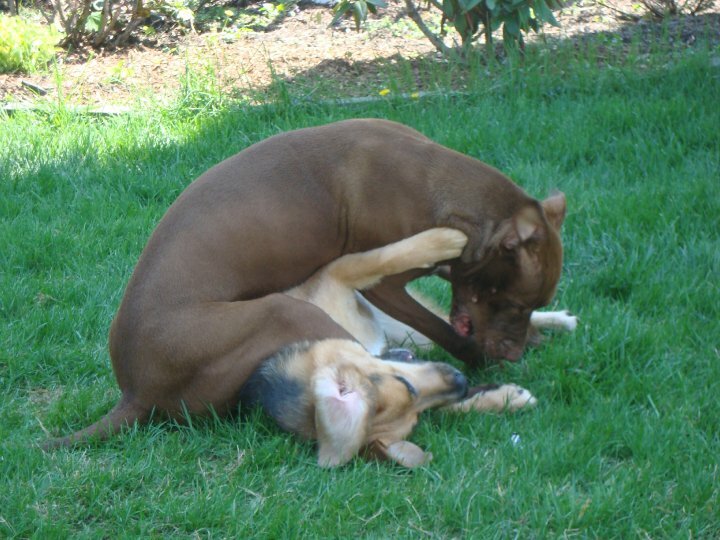 Although, as soon as you mentioned the word “pit bull” people were suddenly interested in other dogs. Corbin also had a few leg issues and had the potential to have some more serious issues down the road. We fostered him for 2 months before we decided there was no way we could let him go. I learned so much for him and he learned so much from us. He knew he was home and I didn’t have the heart to tell him he wasn’t. Corbin became our first (and only, so far!) foster failure. 3. What has kept you going? We waited a few months after adopting Corbin to take in another foster dog. Corb needed some serious training about a month after we adopted him. 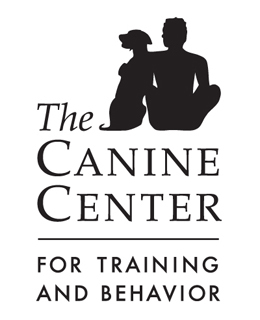 We hired a behaviorist who worked with us and taught us how to work and relate to Corbin. This has proved to be one of the most powerful assets I have had when taking in foster dogs. I have been able to use the training I received on all of our foster dogs, which is so helpful to make them more adoptable. Our first (well, second technically) foster dog was Belle, a GSD/Beagle mix. Corbin LOVES his ladies. It was so nice to have another dog for Corbin to play with and get out all of his excess energy. After that, it just became addicting. As much as we have loved and wanted to adopted just about all of our fosters… we know the bigger picture and know how many more we could save as long as we continue adopting out our foster babies. I love my fosters, even the squirrel-sized ones. 4. Why do you think fostering is important? Rescues wouldn’t be available if people didn’t open their homes to foster dogs. Foster homes allow dogs to get out of the shelter and into a home environment, which some of those dogs have never experienced before in their lives. You learn things about your foster dog to tell potential adopters so you can make sure they go to the right home that can understand and help any issues or quirks they may have. You help teach and train them and every morning they thank you with their big loving eyes. Nothing is more rewarding. Every dog adopted is another shelter dog that can go into foster care, so when you adopt, you’re really saving two lives – a lot of people don’t understand this. In November of 2010 I took over the import for my rescue. I had been volunteering with my rescue for a year prior, but never understood the bulk of the work. I spend close to 30 volunteer hours a week working on rescue related stuff. Every day, I look at the shelters we work with and see all these dogs… knowing that I can’t save them all. I try to stress this to people when asking for foster homes. Each and every one of these dogs deserves a second chance. It’s not their fault they’re in this situation and the only way out if it is through our help. "Sitting on my foster siblings is pretty rewarding for me"
5. What is the most rewarding part of fostering to you? Adoption. Nothing is more rewarding than watching a dog that you have cared for, you have saved and you have helped, walk into their new home, kiss their new family or wag their tail and smile for their new life. As hard as it is, there is nothing in my life that is more rewarding. Returns. Although you like to believe people when they tell you they’re the perfect home and they’re going to do anything need for their dog… people lie. Not all people… but more people than I would like. Although, every time there is a return, I’m thankful that the dog is back in our hands and not living another horrible life, I hate that I trusted these people with my dog. Oreo was returned, and Corbin welcomed him back with a warm lick and a good wrestle. 7. Have you experienced any benefits that you hadn’t expected before you began? 8. Any advice do you have for individuals considering fostering for the first time? Do it. Research rescues and find one you like and just do it. Make the commitment. It’ll be something you’ll never regret. 9. Who was your most memorable foster and why? Oh, my Bethany… Bethany and her sister, Avery, were born in a shelter and didn’t leave until they came to us when they were 5 months old. 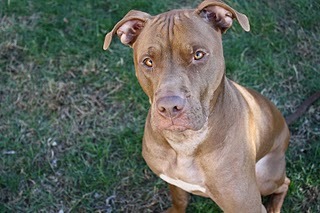 Avery went to another foster home, adjusted very quickly and was adopted just as fast. Bethany was a pancake, flattened to the floor of our home, afraid of stairs, doorways and hallways. She flinched at every loud noise and had this awful look of fear in her eyes. It took Bethany 4 days until she walked upright inside the house… Corbin was very gentle with her and helped her every day. Helping her learn that the world was not such a scary place made it very hard to adopt her out – I felt so close to her, I couldn’t bear the thought of her going to another home. I brought her over to Adam’s dad’s house, and she was adopted by them shortly after. If you met Bethany today, you wouldn’t be able to imagine that shy, scared little girl we first met. Her sister, Avery, was returned a few months later because the family didn’t have the time for her and without the TLC, Avery’s progress was declining fast. Avery was far worse than she was when she was adopted. She now lives with Bethany and they complement each other and help each other out more than I’ve ever seen with two dogs. Since Avery came along, Beth is no longer afraid of stairs, her biggest fear, and they have both conquered being boatin’ dogs together! 10. What is your favorite foster adoption story? Corbin’s, of course :o) But, seriously, I love all of the families that my foster dogs have adopted. I keep in touch with them every so often to check on my pups. They each have their own space in my heart and I will consider them “my” pups forever. Corbin is currently on his 16th foster sibling through the rescue that saved his life, Homeward Bound Dog Rescue in Albany, NY. Hopefully by the time this story is published, that number will be 17 or 18! Jenn would also like to thank Corbin for allowing her to do this interview from her own point of view instead of his. You can follow Corbin’s adventures and his fantastic fostering work at Oh, Corbin. We LOVE handsome Corbin! And, of course, his Mom! 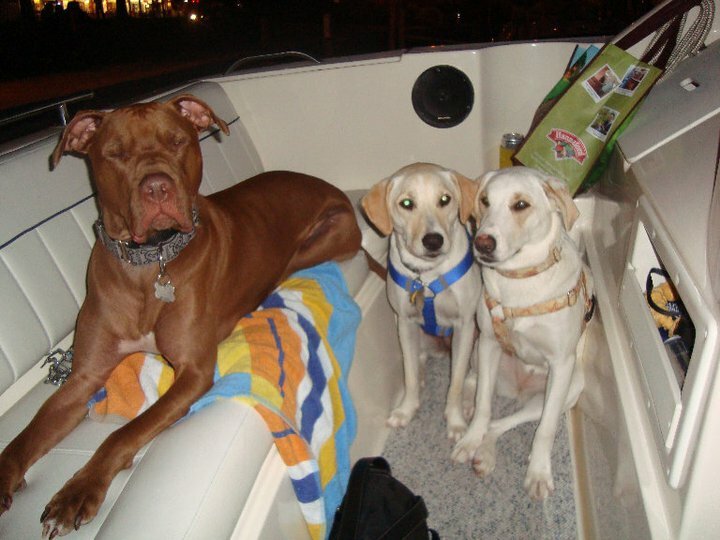 We admire their great work with fosters and just love reading about Corbin’s boating adventures, too! We’ve learned so much about the foster process and how important it is from them. Oh, yeah, Corbin’s gonna be in our Pitties in Frog Post Calendar – hopefully out real soon! love Corbin’s blog! what a great guest series! OoH what a wunderful post! I know Corbin and momma Jenn in da furs and dey is GREAT! What a great guest post! 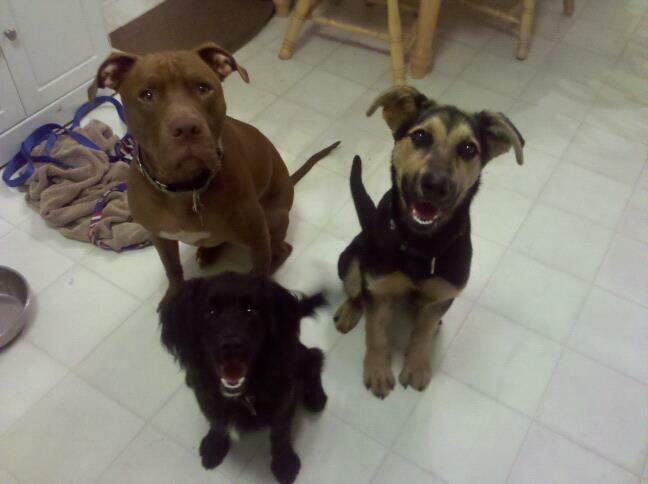 Corbin is too handsome in those pics with his foster sisters! Corbin is one handsome dude, but don’t tell Sir Chick that I said that. Will definitely be adding Corbin to the list of blogs I follow! Our rescue is looking for more foster families and its stories like this that help people realize that yes, they can do it and how rewarding it can be. Well then you’re in for a treat, b/c we have six more stories like Jen and Corbin’s coming up! Wow, what a wonderful post! I’m sure this will get other peeps on the fostering bandwagon! Corbin’s a total keeper fur sure! We knew Corbin, and we knew he fostered, but we didn’t realize the extent of it. So many fosters in such a short time is incredible and amazing! I also never knew the background that Corbin was your first foster and a fail.And it’s so great that he is so tolerant of having so many foster siblings! Thank you Jenn, Adam and Corbin!! Thank-you for sharing. I enjoyed thinking about my experiences with rescue and fostering, and how I would answer the questions. I had such a hard time thinking which dog was the most memorable. Each dog I’ve had through I’ve learnt something from, and I am so happy that I was able to help them find a new home. And it’s also super rewarding to think of their new families, and all that they are gaining from their dog. Who doesn’t love Corbin? He is one handsome and irresistible pup! It was great to see his story along with Jen’s today! Simply amazing!! Corbin and his humans – they’re changing the world…for the better!! The first time I saw Corbin I immediately noticed he could easily be our Wilbur’s handsome brother right down to being a salty dog. Wilbur loves living on our boat. I’m in awe of all you people that foster dogs as I know how much work it is to simply care for one healthy dog with no issues. Thanks so much for the opportunity to do this! It was so fun and I can’t wait to read everyone elses! Such an inspiration! Thank you for introducing me to another fantastic blog – I can’t wait to read more! such a great post! i really really really hope to be able to foster dogs one day. What a terrific amount of dedication and time you have committed to rescue. Thank you from the bottom of my heart.